Over the last twelve months, we worked with over ten thousand vulnerable people in our local community and beyond, welcoming them into our theatre and creating a safe artistic space for them. 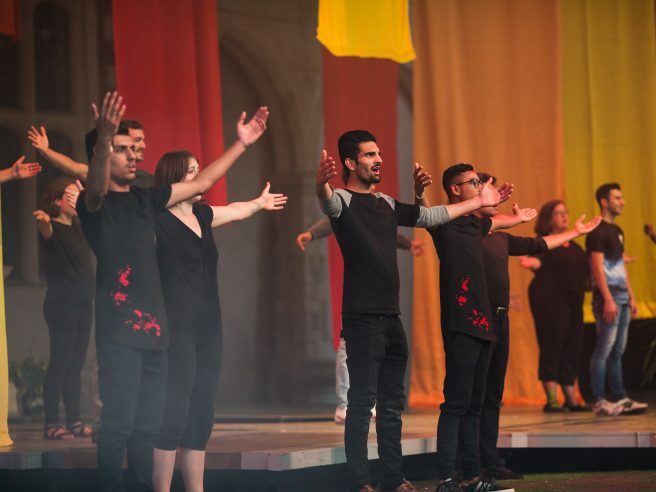 We supported families and individuals affected by the Grenfell Tower tragedy, demonstrating strength and solidarity at the Hope for Grenfell Memorial Gala as these groups came together to perform their song ‘Help me believe’, written by Will Todd and conducted by Gareth Malone. At the Schools’ Matinee, we welcomed a thousand schoolchildren and their teachers to our theatre. The children watched a full-length performance of La traviata and stood roaring with applause at curtain call. We also worked with the elderly, young families, people with disabilities, those with poor mental health and rough sleepers. As an arts company we whole-heartedly believe that it is not enough just to produce great work on stage; we must use our resources and vision to play a role in society and push ourselves to fully engage the community. One of our projects this year was Refuge in Harmony. Over a four month period we worked with over 100 young refugees to create and perform a new piece on the theme of ‘welcoming’. The refugees we worked with were aged between 15 and 22 years old, from over 16 countries across the world, and they had all recently arrived to the UK without any friends or family by their side. Each and every one of them was inspirational, but I’m going to tell you Oslan’s story. Oslan was a refugee from Iraq. He moved to the UK two years ago and, whilst almost fluent, his English was accented and mumbled. He was bright, polite, smart, cheerful and charming. He would hold doors open for people, help distribute feedback forms at the end of sessions, enthuse the group and he’d do it all with a wonderful smile. He had never performed before, but had watched performances in his home country before he was forced to leave. Oslan first visited Opera Holland Park in the summer of 2017, when two groups of refugees received a behind-the-scenes visit and enjoyed a performance. After his visit he remarked that he was struck by the equality behind opera – something we’re not accustomed to hearing in this industry. Although the language used on stage was foreign to him, he understood the story through the emotive power of the music. To him, opera confirmed that you don’t need to speak the same language to get along. It was a wonderful experience of cultural and musical embrace, and when he joined our Refuge in Harmony project at the very first workshop almost a year later in April 2018, he was ready to show people that everyone is the same. Oslan didn’t want pity, he wanted acceptance as a new citizen, and more than anything he wanted to have fun. 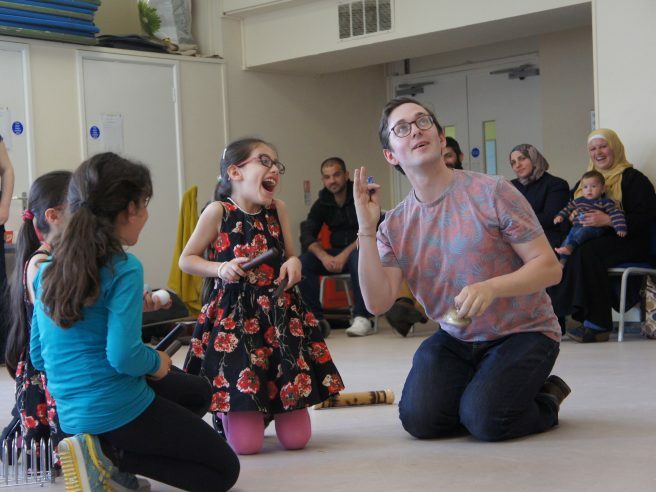 During the project we workshopped the stories that the group would perform on stage at our Open Day alongside singers from Opera Holland Park and our resident orchestra, the City of London Sinfonia. A broad range of stories were shared, from a hatred of public transport to a love of pizza, and from the fear of visiting the doctor alone to missing the sound of a mother’s voice. With their energy, laughter and useful banter, it was easy to forget that the young people had been through unimaginable things: torture, war and famine, and that their ordeal was still ongoing, with solicitors, applications for asylum and the fear of being deported constantly on their minds. It was crucial to use that the workshops were an escape – a refuge in harmony. Oslan was excited but apprehensive to begin the sessions. Drama and singing were not something he had ever done before, but with the facilitators and professional singers leading the way he relaxed into it. His enthusiasm and dedication spread to other members of the group, and soon they embraced the space as a safe, supportive and ultimately liberating environment. The language barriers, self-constraint and self-consciousness were overcome, everyone was united together and Oslan was given a solo role due to his commitment. On the day of the performance there was a mixture of nerves and excitement among the group. It had been a long journey from coming up with ideas for the performing to creating the music, to the three weekends of rehearsals, and it was a beautiful moment to see the work of the group come to fruition. Everyone gathered in the park for a picnic before the performance, and the difference in the group from the beginning of the project was evident. The young people chatted confidently among themselves; no longer were they unsure of their environment or hindered by their language skills. That energy and confidence stayed with them as they stepped on stage later to perform in front of over 400 people. It would be a lie to say that Oslan was a natural on stage – his ease and confidence took a lot of hard work and practice – but he performed his role well, having fine-tuned his enunciation and voice projection. He was visibly proud of himself when the performance finished, and all the participants looked delighted at the rapturous applause as they took their bows. As soon as they got backstage they erupted with joy. One of the professional singers said that they didn’t realise how much the project had meant to the young people until that moment. The project was a journey and the participants had come out the other end sharing stories, welcoming a new audience and receiving applause in return. Oslan and his new friends spent the rest of the afternoon in Holland Park, kicking a ball around with the locals and sharing the remaining picnic food with them. When I asked him how he found the project, Oslan was almost speechless. Article by Inspire Coordinator Lucy Curtis, first appeared in Chorus magazine, Autumn 2018. Refuge in Harmony welcomes 40 newly arrived unaccompanied minors from around the world to Opera Holland Park, inviting them to settle into their new community through opera. 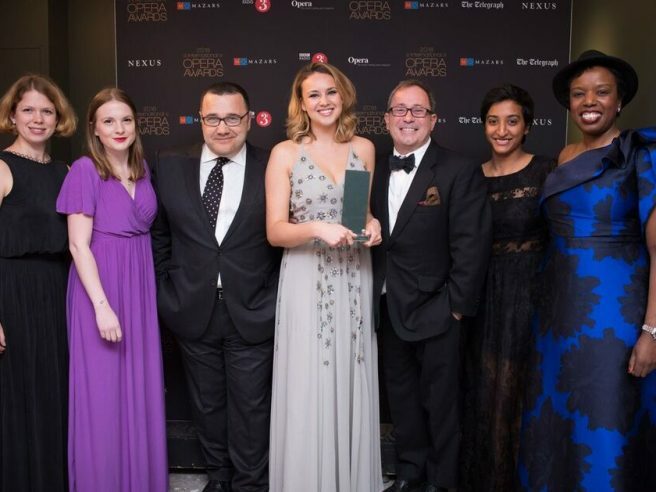 Opera Holland Park's International Opera Award winning outreach and education programme is dedicated to working with the community to enhance people's lives through the means of opera.